The temptation of playing all the shots in his armory is sometimes too much, but a good player will be able to curb himself and avoid essaying the high-risk shots. The psychological demands of the varied aspects of cricket are numerous, and more so for batsmen. One mistake, and the batsman is back in the pavilion. These demands vary in amount and type at different batting positions. An opener should be quick to react to the missiles hurled by the fast bowlers and be a good judge of the line and length. On the other hand, a middle-order batsman needs to look after other aspects. He should be able to alter his game depending on the match situation. He may either need to attack to stamp his team's authority or drop anchor in the event of a collapse. 'Motivation' is a big and powerful word, and extremely essential from the batting point of view. 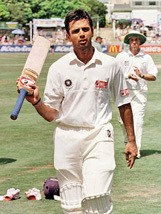 A living example of motivational power is our very own Rahul Dravid. A few years back, he was struggling to retain his place in the one-day side despite possessing a rich technique and the ability to play all the strokes. It is sheer motivation that enabled him not only to cement his place, but also go from strength to strength and finally become the super batsman he is regarded as today. Another critical attribute is 'Concentration'. A batsman who can concentrate for long hours is most likely to succeed at the highest level. 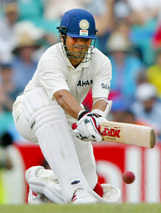 Here again, the first name that comes to mind is Rahul Dravid, an epitome of concentration. With concentration, a batsman can perform in tight situations, ignore the glare of the bowlers and the harsh words of the fielders. Without concentration, one simply cannot bat for a particular length of time. Emotions, they say, make you weak. True as far as batting is concerned. Of all the emotions, frustration, nervousness and elation are most commonly experienced. I. A player can get frustrated when he is not able to score quick runs needed by the team. Inability to rotate the strike often leads to the batsman getting out. II. A little bit of pre-match nervousness is good to have. But if this nervous energy is brought onto the crease, the batsman invariably falls prey to a quality opposition bowler. Virender Sehwag - Self-belief and confidence. III. 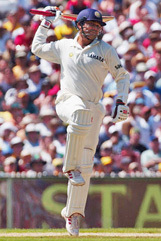 So often do we see a batsman getting out after a landmark is achieved. This happens when the feeling of elation and a sense of achievement are carried to the next ball bowled. The confidence of being one of the best in the business is a tool that a batman can be proud to possess. A confident batsman is sure of his goals, plans and how he wants to execute those plans. On the other hand, a less confident batsman is hesitant, unsure and actually fearful of failure. Virender Sehwag illustrates what self-confidence can do to a cricketer. The lad does not have a technique as faultless as say Dravid's. But he has self-belief and tons of confidence. He backs his ability to succeed, and boy, hasn't he succeeded! It is thus pretty evident that there is a great deal more to batting than just a good technique. A batsman wins or loses his battles in the mind.